Civil War in the Southwest. Civil War battles fought in the American Southwest cannot be measured against the savage struggles that raged in the East where tens of thousands of Union and Confederate soldiers clashed and died. Compared to the epic battles in the East, the little-known clashes in the deserts and mountains of the Southwest were nothing more than a series of small skirmishes. Opposing forces rarely numbered more than two thousand, and usually no more than a few hundred engaged in the fighting at one time. However, large or small, the size of the battles meant little to the men on both sides who were wounded, killed or captured fighting for their beliefs. In early 1861, Colonel John R. Baylor was placed in command of the Second Texas Rifles and the western Texas frontier from Fort Worth in the north to the Nueces River south of San Antonio. Baylor, a former Texas rancher, farmer and slave owner, was ordered to occupy the chain of former U.S. Army posts that ran along the frontier and guard the route of communications to El Paso from raids by the Apaches and Comanches. However, Baylor was not content to sit out the war fighting Indians. The Colonel had his sights set on the conquest of New Mexico and Arizona. On February 14, Confederate President Jefferson Davis made Baylor�s vision possible by ordering the occupation of the western territories. Colonel Baylor began his western campaign by planning an attack on Fort Fillmore near Mesilla, New Mexico with 260 troops, but the fort�s Union commander Major Isaac Lynde was warned of the impending strike and Baylor decided to occupy Mesilla instead. 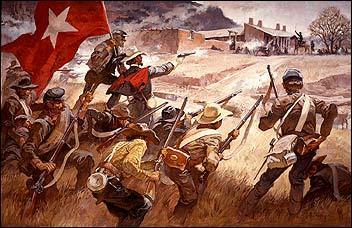 Major Lynde then marched on Mesilla with 360 men and demanded that the Confederates surrender. Following a series of sharp skirmishes and raids, the Union troops were forced to retreat to the northeast toward Fort Stanton. Colonel Baylor pursued and eventually rounded up 100 Union stragglers, returning to Mesilla with much needed captured Union supplies and $9,000 in Federal Treasury notes. On August 1, 1861, Colonel Baylor issued a proclamation establishing the Confederate Territory of Arizona, which included the former U.S. Territories of Arizona and New Mexico south of the 34th parallel, and declared himself governor. The new governor realized that he would have to occupy Arizona to make the proclamation stick, so he marched his men west. When the Confederates reached Tucson the union forces retreated in disarray and Baylor quickly established a Confederate government. The cross-country Butterfield stagecoach route that ran through Texas to Arizona and on to California was now firmly in the hands of the Confederacy, forcing the Federal government to move the route further north through Nebraska and Utah. 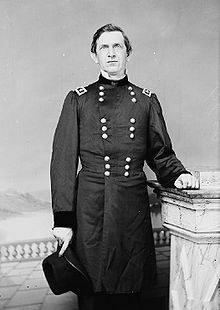 The strong Union forces that remained in northern New Mexico would be left to General Henry Hopkins Sibley. Prior to the war, Sibley served as a major in the Union Army. Like Baylor, he also had a vision of invading the West, so he traveled to Richmond. In the capital, Sibley argued that the Union had withdrawn from southern New Mexico and that the northern part of the territory was ripe for invasion. If he moved quickly north with a brigade of troops�approximately 2,500 men�he could take control of Santa Fe and the valley of the Rio Grande, move into Colorado along the Santa Fe Trail, capture Denver and the gold fields and then march west to California. President Davis agreed and commissioned Sibley a brigadier general but he was on his own. The Confederate government could not supply him with money, supplies or troops. Undaunted, General Sibley returned to Texas where he began to raise the Confederate Army of New Mexico. 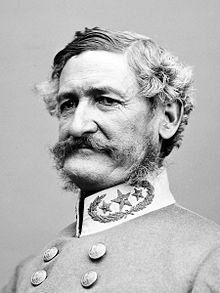 After issuing a proclamation claiming New Mexico for the Confederacy, General Sibley advanced north from Fort Thom in February 1862 with 2,590 ill-equipped troops. His intentions were to follow the valley of the Rio Grande, capturing Fort Craig, Santa Fe and Fort Union as he marched north. Sibley�s forces neared Fort Craig on February 13. Within the fort�s walls were nearly 3,800 men commanded by Colonel Edward Canby. Unsure of the size of the Confederate force, Canby used wooden �Quaker guns� to make Fort Craig appear stronger than it actually was. Falling for the ruse, General Sibley judged the position too strong to be taken by direct assault. Instead of attacking, he deployed his men south of the fort, hoping to entice Canby into launching his own attack. The Confederates remained in place for three days, but Canby refused to take the bait. Growing short of supplies, Sibley called for a council of war on February 18. 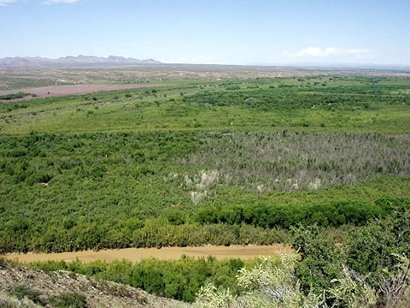 A decision was made to bypass Fort Craig by retreating seven miles south to the village of Paraje and crossing to the east bank of the Rio Grande. Sibley would then move his forces north six miles past the fort and sever Canby�s lines of supply and communication by capturing the ford at Valverde. Unfortunately, the deep sand forced Sibley�s men to make an early dry camp and Union scouts took note of their movement. Canby immediately dispatched a mixed force of infantry, cavalry and artillery to the Valverde ford under the command of Lieutenant Colonel Benjamin Roberts. Slowed by the movement of his guns, Roberts ordered Major Thomas Duncan to ride ahead with his Union cavalry and occupy the ford. Meanwhile at daybreak, General Sibley sent Major Charles Pryon to scout the ford with four companies of the 2nd Texas Mounted Rifles supported by Major Henry R. Raguet with five companies of the 4th Mounted Rifles. Reaching a small grove of cottonwoods near the ford, Pryon�s men dismounted and began to water their horses when they discovered that the ford was occupied by Union cavalry. A hotly contested firefight erupted as the Confederates fell back and took cover in a dry riverbed, and Pryon called for aid from the remainder of Scurry�s 4th Regiment. By this time, Lieutenant Colonel Roberts reached the ford, moved his Federal artillery into place on the west bank and advanced with his cavalry in a loose skirmish line. Although he possessed superior numbers, Roberts did not press the attack home. Arriving on the scene, Colonel Scurry moved the 4th Regiment into the line on Pryon�s right. Scurry�s Confederates were brought under fire by Union rifleman, but the southerners were largely armed with revolvers and shotguns which lacked sufficient range to respond in kind. Learning of the standoff, Colonel Canby left only a skeleton force to defend Fort Craig and advanced toward the Valverde ford with the remainder of his Union forces. When he reached the ford, Canby left two regiments of infantry on the west bank and pushed the rest of his men across the river. The Federal artillery under the command of Captain Alexander McRae continued to pound the Confederate positions as the Union forces slowly began to gain the upper hand on the field. Aware of the plight of his men on the river, Sibley reinforced his position with Colonel Tom Greene�s 5th Mounted Texas Rifles and elements of the 7th Mounted Texas Rifles. Meanwhile, either ill, exhausted or drunk, Sibley retired to a field ambulance in the rear and turned over the command to Colonel Greene. Early in the afternoon, Greene authorized an attack on the Union right by a company of the 5th Texas Mounted Rifles armed only with lances. Company B commanded by Captain Willis L. Lang launched their gallant attack against a company of Colorado volunteers that had been hastily recruited and hurried south from Denver. The volunteers coolly held their fire until the courageous lancers were within a few yards of their line then unleashed a deadly volley into the charging Confederates. Men and horses died in screams of pain as a wall of hot lead shattered the lancers� advance. Company B suffered a greater loss of life than any other company in the Army of New Mexico. Shortly after three in the afternoon Colonel Canby arrived on the battlefield. After assessing the situation, he decided to try and force the Confederate left flank. He began by ordering Colonel �Kit� Carson�s green and untested New Mexico brigade to cross the river and move to an advanced position supported by Captain McRae�s artillery battery. Seeing Carson forming his Federal troops for an assault, Colonel Greene ordered Major Raguet and two companies of the Confederate 4th Regiment to launch an attack against the New Mexicans to buy some time. Raguet�s few men were repulsed, and Carson�s New Mexico brigade began to advance. Greene then ordered Colonel Scurry and the remainder of his 4th Regiment to assault the Union center. Screaming their Rebel yell, Scurry�s men surged forward in three waves, striking the Federal line near McRae�s battery. The Union artillery battery poured round-after-round of deadly grapeshot into the ranks of the charging Texans, but Scurry�s Confederates bravely fought their way through the hail of lead and fell on the Federal artillerymen with a terrible hand-to hand savagery rarely seen in the annuls of American history. Within a few minutes, the Texans had overrun the Union guns and McRae and half his men lay dead. The Union troops fled for the Rio Grande, many throwing their weapons down as they ran. A number of them were gunned down by the Confederates as they floundered across the river and headed for the safety of Fort Craig. The Union suffered 222 killed and wounded while the Confederates lost 183. Although the Battle of Valverde was a victory for the South, Fort Craig remained firmly in Federal hands. Badly in need of supplies, Sibley�s forces bypassed Fort Craig and began a slow march up the Rio Grande, taking possession of Albuquerque on March 2, 1862. The Federal forces left the territorial capital of Santa Fe unprotected, and Major Pyron and his 2nd Texas Mounted Rifles hoisted the Confederate flag over the Palace of the Governors on March 13. As low as the Confederates were on supplies, Sibley knew his men could not remain idle for long, and he decided to march on Fort Union. Located on the Santa Fe Trail some 100 miles northeast of Santa Fe, Fort Union was the main Federal supply depot and arsenal in the southwest. Between Santa Fe and Fort Union lay the narrow confines of Glorieta Pass. Meanwhile, the First Regiment of Colorado Volunteers under the command of Colonel John P. Slough made a 400 mile, thirteen-day forced march south from Denver to reinforce the Federal garrison at Fort Union. Upon their arrival, Colonel Slough merged his 950 Colorado volunteers with the 800 regulars and volunteers already at the fort and assumed command of all the troops. On March 22, Slough marched out of Fort Union with 1300 men, most of them Colorado volunteers. 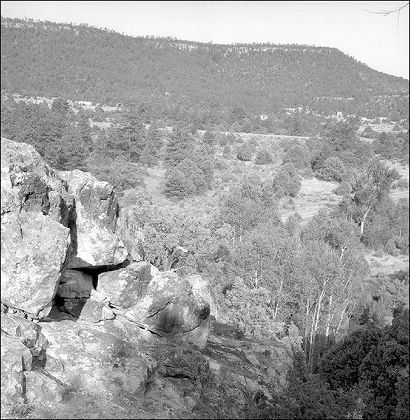 Two days later his force was camped at Bernal Springs about forty miles east of Glorieta Pass. Unaware that the garrison at Fort Union had been reinforced, General Sibley ordered Major Pyron�s 2nd Regiment of Texas Mounted Rifles and four companies of the 5th Mounted Rifles under Major Shropshire to proceed to Fort Union. The 4th Mounted Regiment under Colonel Scurry and the First Battalion of the 7th were ordered to ride by way of Galisteo and join up with Pyron on the road to Fort Union. On March 25, Pyron�s forces reached the west entrance to Glorieta Pass and set up camp at Johnson�s Ranch. Late in the afternoon of the same day, Union Major John Chivington marched 35 miles west from Bernal Springs with 400 men and set up a midnight camp at Kozlowski�s ranch near the east entrance to Glorieta Pass. Chivington advanced his forces early on March 26 and ran into some Confederate pickets around 2:00 pm. To the rear of the pickets, Pyron�s main force was set up across the floor of the pass with their artillery in the center. Chivington ordered an advance on the Confederate position, but the fury of Pyron�s guns drove the federal infantrymen back. After falling back to regroup, Chivington split his forces, sending them onto the heights on both sides of the pass where they caught the Confederates in a deadly crossfire, forcing them to retire. Pyron quickly retreated to a narrow section of Glorieta Pass and formed a new defensive line. Once again the Federals flanked the confederate line and punished the rebels with a deadly hail of enfilade fire until they were forced to withdraw. A last minute charge from Chivington�s cavalry captured a few of the Confederate rear guard, but with darkness coming on, the Federals returned to Kozlowski�s ranch and set up camp for the night. Estimates of casualties ranged from 132 to 223 for the Confederates and from 21 to 32 for the Union. No fighting occurred the following day, March 27. Instead, both sides used the day to bury their dead, tend the wounded and consolidate their forces. Pigeon�s ranch was used as a Union field hospital. Colonel Slough arrived at Kozlowski�s ranch with 900 men after a forced march from Bernal, swelling the Union ranks to around 1,300, and Colonel Scurry joined up with Major Pyron�s forces at Johnson�s ranch, taking command of approximately 1,100 Confederate troops. 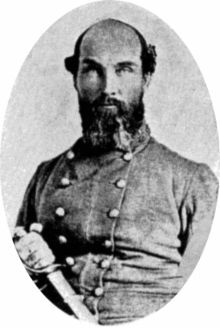 On the morning of March 28, Colonel Scurry advanced his Confederate forces into the western reaches of Glorieta Pass and launched an attack on the Federals. Here Scurry made a fateful decision. Believing that his supply train would impede the advance, he left it behind at Apache Canyon with only a small guard. Scurry halted his advance a mile west of Pigeon�s ranch and formed a line of battle. Union scouts informed Colonel Slough of the Confederate movement and he quickly formulated his plans. Major Chivington and 430 men would secretly cross over Glorieta Mesa and harass the Confederates from the rear, while Slough and the remainder of the Federal troops advanced on the enemy. The Federals arrived in the vicinity of Pigeon�s ranch about 10:30 am where they broke ranks, filled their canteens and rested. While the men rested, Colonel Slough sent his scouts ahead to reconnoiter the pass, but they galloped back a few minutes later with news that the Confederates were deployed for battle in the trees no more than 800 yards distant. Confederate artillery rounds began to fall in among the Federals as they quickly formed to meet the threat. For the next six hours, fighting raged among the rocks and trees of the narrow pass. The rugged terrain did not permit the use of cavalry, but dismounted small arms and rifle fire was deadly for both sides. The battle was close fought, but the Texans had a superior position and a greater number of men, and eventually the Union was forced to grudgingly give ground. Colonel Slough ordered the Federals to fall back 400 yards near Pigeon�s ranch and form a new line across the valley. Once again Scurry gave the order to advance, and the fighting raged for another three hours. After two of their three guns were knocked out and most of the artillerymen picked off by Yankee sharpshooters, the Confederates were forced to rely on their superior numbers to carry the day. Eventually, they gained control of Sharpshooter�s Ridge, a key position that enabled the Confederate riflemen to suppress the Federal guns. Hoping to capture the Union supply train, Colonel Scurry called for one last charge, but the Confederates were again driven back by the fury of the Union defense. 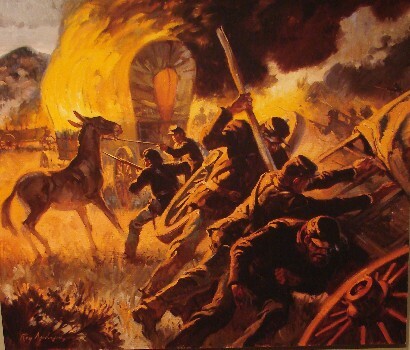 By 5:00 pm, both sides were exhausted from the day-long, bitter fight, and Colonel Slough ordered the Federal troops to gradually withdraw to the camp at Kozlowski�s ranch. The Confederates cheered when they realized the Federal withdrawal left them holding the field, but the celebration was short-lived when news arrived that their supply train at Apache Canyon had been completely destroyed. Undetected, Major Chivington�s men had reached the heights on the western end of Glorieta Pass overlooking the canyon 1000 feet below. The federal troops slid, crawled and were lowered by ropes to the base of the cliff from where they launched a surprise attack on the small Confederate guard. The heavily laden Confederate supply wagons were destroyed and the horses and mules either killed or driven off. Chivington and his men immediately returned to Kozlowski�s ranch to support Colonel Slough, but Scurry requested a cease fire when he learned of the destruction of the Confederate supply train. The following day was spent burying the dead and tending the wounded. This time the Confederates used Pigeon�s ranch as a field hospital. Casualty figures vary, but the Union suffered roughly 38 killed, 64 wounded and 20 captured, while the Confederates had 36 dead, 60 wounded and 25 captured. Two days later, the Texans retreated to Santa Fe. General Sibley attempted to save the campaign by writing to the Governor of Texas for reinforcements and supplies but he received no reply. With no aid in sight, the Texans were forced to retreat to southern New Mexico and eventually begin a long, starving march back to San Antonio. By July 1862, all Confederate troops had been withdrawn from Arizona and New Mexico Territories and for the duration of the Civil War the Southwest remained under Union control. Lovers of history may view many of the sites of the Battle of Glorieta Pass by visiting the Pecos National Historical Park. The park is located about 17 miles east of Santa Fe, New Mexico and is composed of several noncontiguous units. 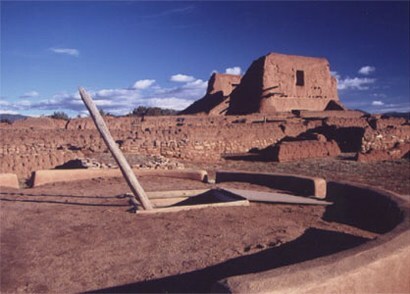 The main unit of the park preserves the ruins of Pecos Pueblo a National Historic Landmark. Francisco Coronado visited the site in 1540 during his infamous search for the Seven Cities of Gold and a Spanish mission was established there in 1619. Other units of the park preserve Glorieta Pass battlefield sites including Johnson�s Ranch, Pigeon�s Ranch, Apache Canyon and Kozlowski�s stage coach stop on the Santa Fe Trail, as well as a stretch of wagon ruts that run along the path of the historic trail. Park officials request that you stop at the Visitor Center before touring the sites. References for "Civil War in the Southwest"
Alberts, Don E., Rebels on the Rio Grande: The Civil War Journal of A. B. Peticolas, Albuquerque, NM: University of New Mexico Press (1984). Frazier, Donald S., Blood & Treasure: Confederate Empire in the Southwest, College Station, TX: Texas A&M University Press (1995). Hall, Martin H., Sibley�s New Mexico Campaign, Austin, TX: University of Texas Press (1960). Josephy Jr., Alvin M., The Civil War in the American West, New York, NY: Alfred A. Knopf (1991). 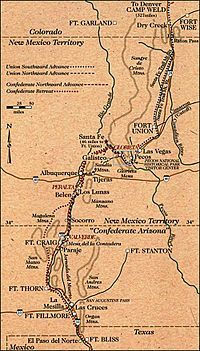 Kerby, Robert L., The Confederate Invasion of New Mexico and Arizona, 1861-1862, Tucson, AZ: Westernlore Press (1958, 1995). Taylor, John, Bloody Valverde: A Civil War Battle on the Rio Grande, February 21, 1862, Albuquerque, NM: University of New Mexico press (1995). Whitlock, Flint, Distant Bugles, Distant Drums: The Union Response to the Confederate Invasion of New Mexico, Boulder, CO: University Press of Colorado (2006).